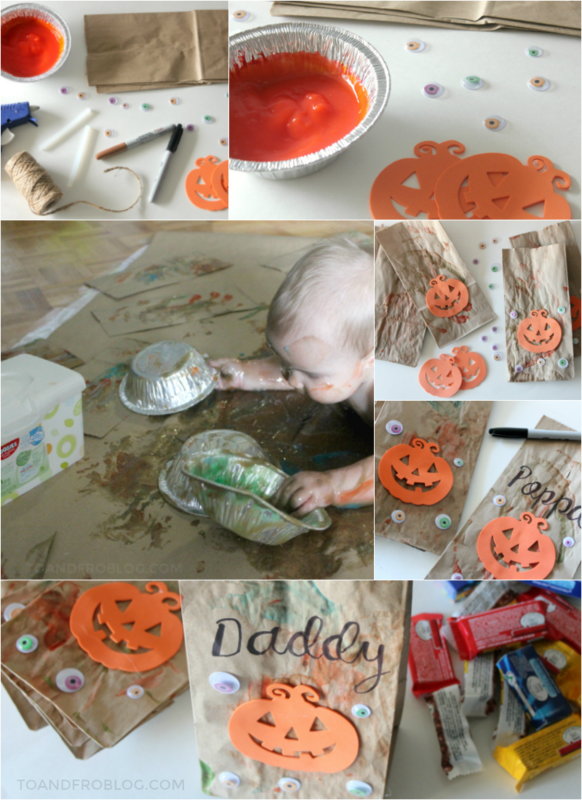 Looking for a fun activity to celebrate you little one's first Halloween? 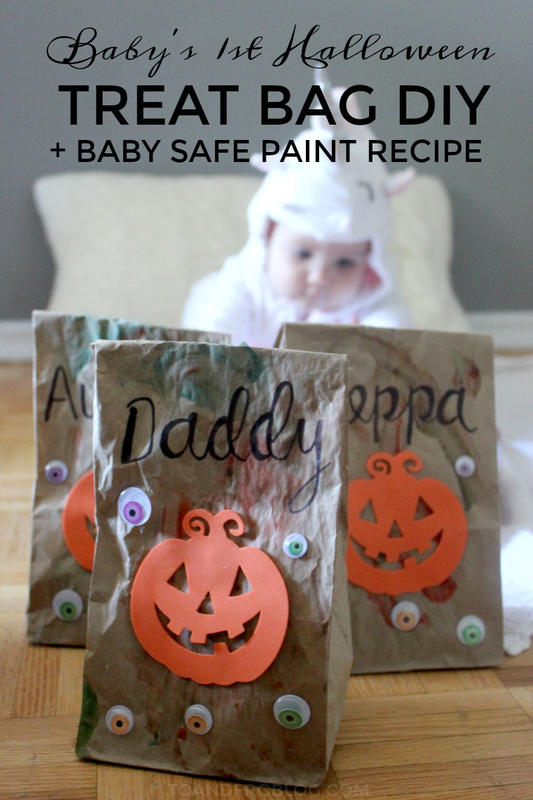 Make your own Halloween treat bags with this tutorial, and simple recipe for baby-safe paints. As a child, Halloween was one of my favourite times of the year. What's not to love about dressing up in a fun costume, canvassing the neighbourhood with your friends and then devouring all of your candy until your stomach hurts? Now that I have a daughter of my own, I can’t wait to celebrate Halloween through her eyes (and candy bag). At 7 months old, Morley's a little young for the typical Halloween shenanigans. However, we still plan on celebrating her first, by dressing her up in a super adorable costume and giving family members these homemade Halloween treat bags, decorated with baby-safe paints and filled yummy goodies. Set up baby’s workspace - i.e. high chair, bath tub, living room floor, outside, etc. 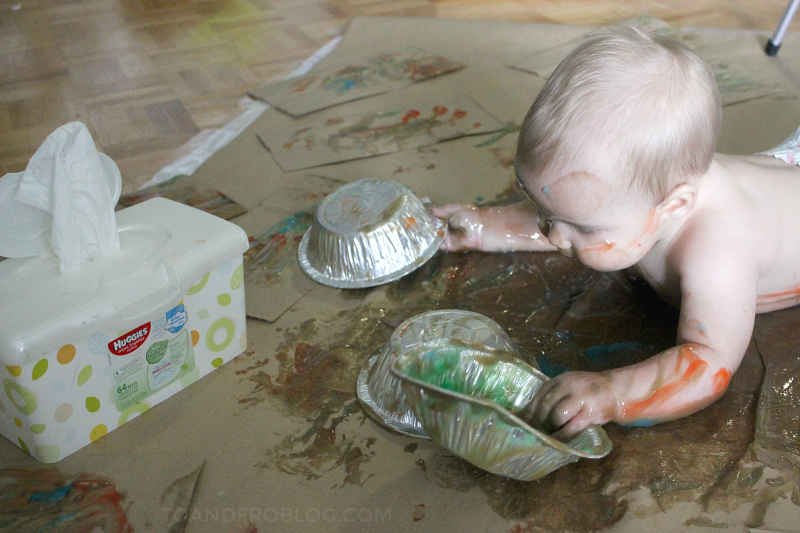 This activity can easily be done in the highchair, to help contain the mess, or by taping a garbage bag and/or craft paper to the floor, making it a great tummy time activity. We chose to do this activity on the living room floor by layering garbage bags with craft paper on top. This made it much easier to clean up when the activity was done. Lay out the paper bags and paint (in the pie tins) on the working surface. Set baby up. Make sure they are in their diaper, or clothes that can potentially be ruined by the paint. Make sure you are also in clothes that can get dirty, because you will get dirty! If your child is old enough, provide them with painting tools. If not, their fingers will do just fine. Let baby go to town on creating their masterpiece. Once they are finished painting (or in our case, start to fall asleep in the paint), immediately clean baby. I recommend having Huggies Natural Care wipes handy and a bath ready to go. Since the paint is quite thick, allow the bags to dry for at least 24 hours. Once the bags are dry, it is time for mom and/or dad to take over the activity. Decorate with Halloween-themed stickers, stamps, etc. Using the glue gun, we added foam pumpkins and googley eyes. Using a marker, add recipient's name to the bag. Fill with candies, tie closed and deliver to that special someone! Combine ingredients in a small sauce pan and stir until combined. On medium low heat, warm until thickened, stirring continuously. If mixture becomes too thick, or goopy, add a bit more water to thin it out. Divide mixture equally amongst containers of choice. Choose containers that are baby safe, and easy for baby to access (i.e. small aluminium pie plates). Add food colouring to achieve colour of choice. Stir to combine. Leftover paint can be stored in a sealed container in the fridge for up to 3 days. Important notes: Any finger paint that you use for young children must be non-toxic by mouth and non-irritating to the skin. If your child is allergic or intolerant to any food substances in this recipe, please do not use this paint. These paints are not to be eaten, but if tasted, are safe for baby. And I promise you, there will be tasting. Please do not leave your child unattended while doing this activity. Painting is such a fun activity for young children. Not only does it allow them to express their creativity (yes, even at 7 months old), but it’s also fun! Sure, it can make a mess, which can equal stress for us adults. But for baby, messy is good. 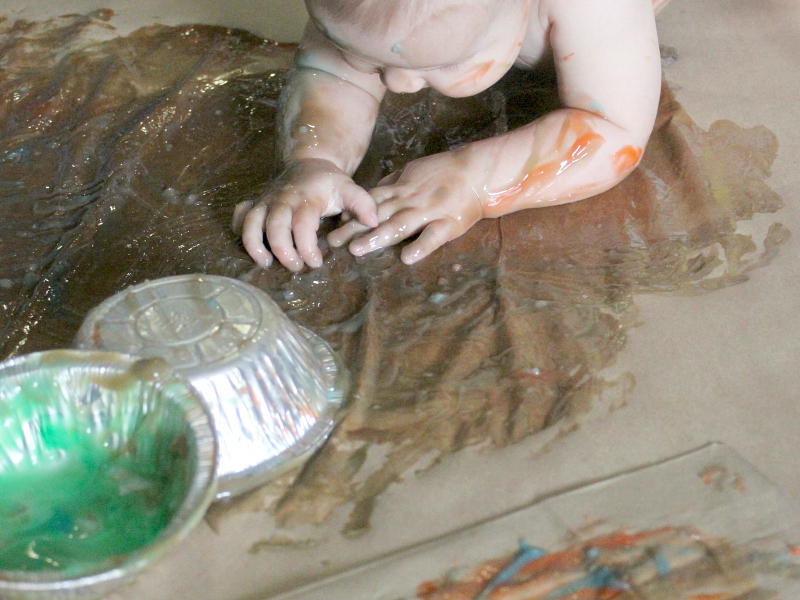 Messy play stimulates the senses, allowing baby to explore different colours and textures. It also helps develop hand and eye coordination and fine motor skills. What may look like a mess to you, is actually a learning experience for your child. 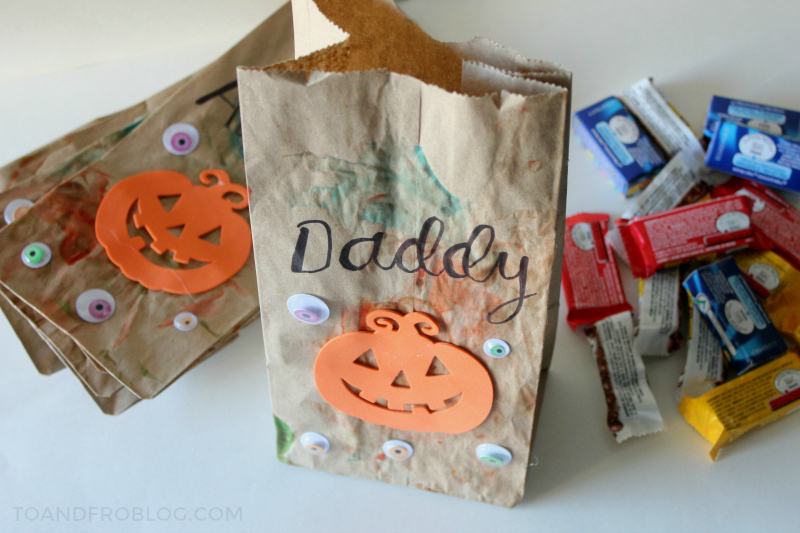 So, roll up your sleeves and have some fun creating these Halloween treat bags. They are sure to be a hit amongst family and friends! 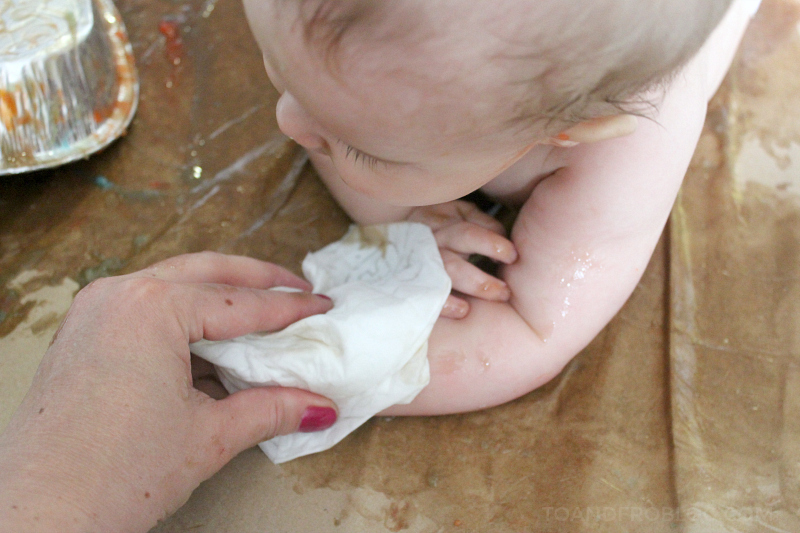 To help keep the mess at bay when doing this fun activity with your little one, turn to Huggies Natural Care wipes! They’re gentle on baby’s skin and do a great job of cleaning up all sorts of messes. Huggies products, including these Natural Care wipes, can be found in the baby care (diaper, wipes, creams, etc.) aisle at your local Babies “R” Us. 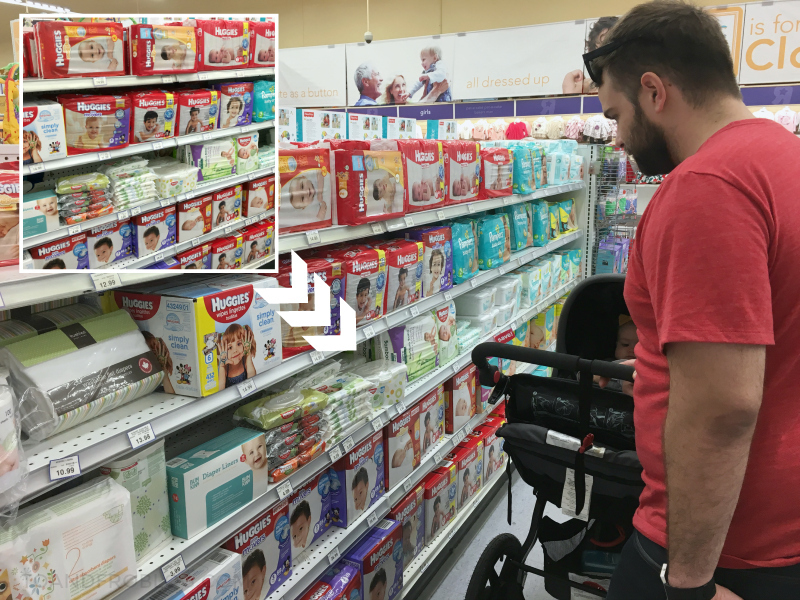 Location of Huggies products, including Huggies Natural Care wipes, in Babies "R" Us. 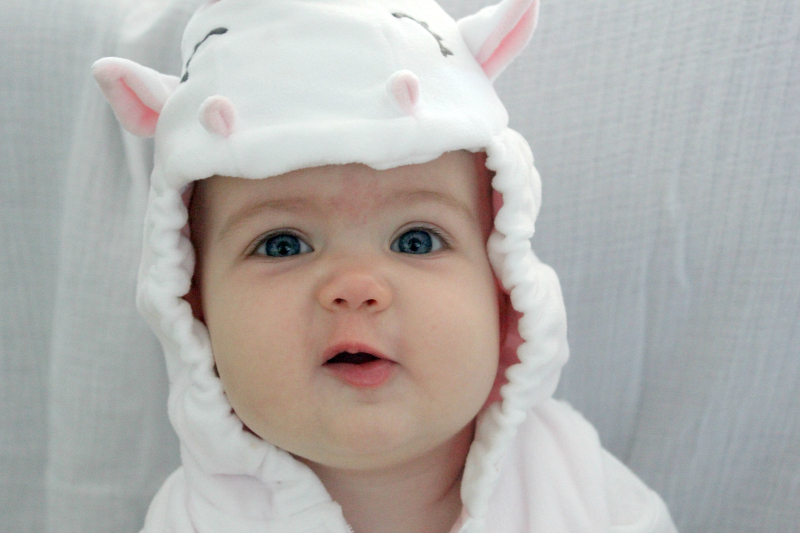 Did you know that Babies “R” Us is more than just a retailer destination? 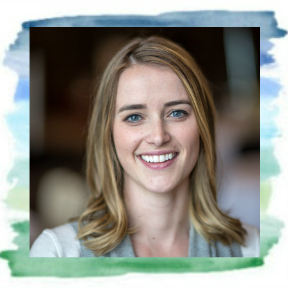 I love shopping in store because not only do they have a great selection of baby products, from diapers and wipes, to items to help celebrate baby's first Halloween (like super cute costumes) and beyond, they are also a great resource for all things baby, including some great baby-friendly events! Make sure to visit your local stand alone Babies “R” Us on 10/15 from 11am-12pm for some Halloween celebrations with baby! Celebrate baby’s first with a keepsake craft and parade around the store, and help mom get ready for colder weather with great product solutions and tips. This celebration is a great opportunity to meet and mingle with local moms who have babies of similar age, and your chance to win some incredible giveaways and raffle prizes! Happy Halloween, from our family to you and yours! How do you celebrate baby’s firsts? Any exciting Halloween plans? I’d love to hear!